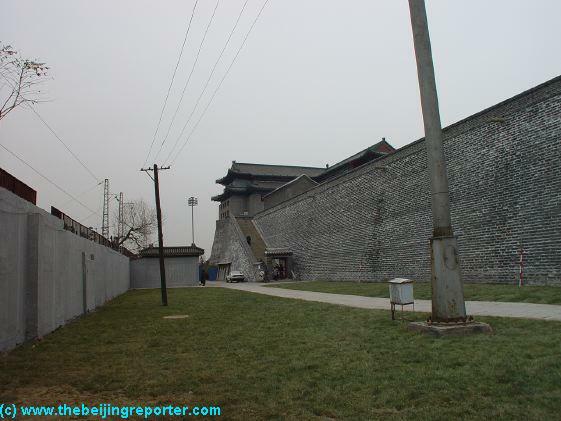 Located some 500 meters South of the Beijing Ancient Observatory (at JianguoMen) is another Historical Beijing Landmark. 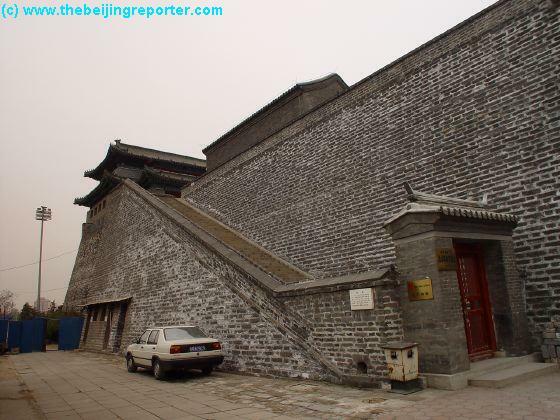 The South-East Corner Watchtower ( Dongnan Jiaolou') is another Part of the Old Cities' Ancient but now Largely dismantled City Walls. 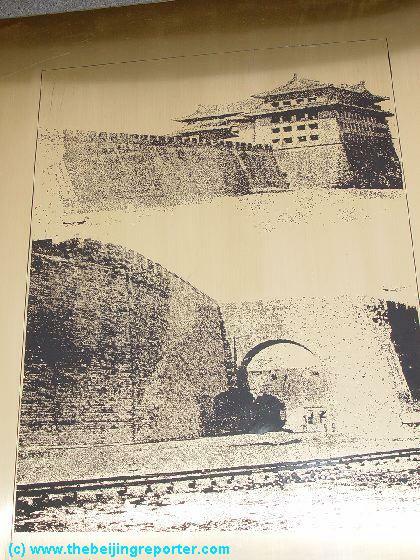 The DongBianMen or South-East Corner Watchtower ( Dongnan Jiaolou') is dates back to the earliest years of the Ming Dynasty Era at which time Beijing was turned into the Capital of the Empire after a Civil War that left Nanjing to hazardous a Capital for the new Emperor, the usurper of the Throne, Yongle came to power. 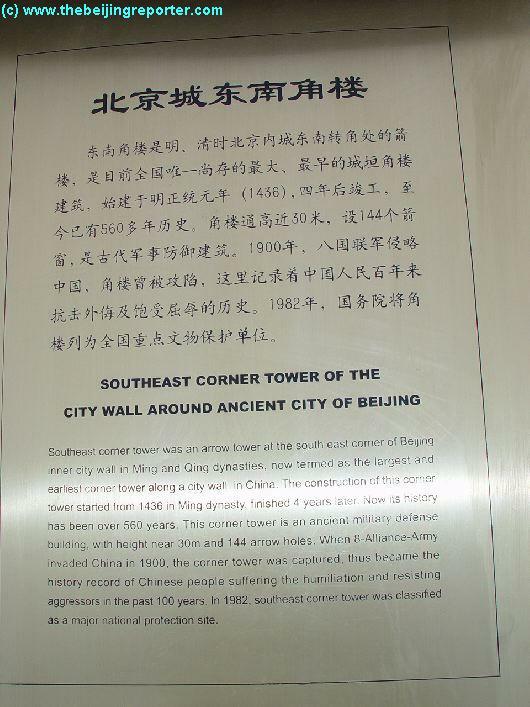 Today the South-East Corner watch-tower of Beijing is the largest remaining corner watchtower in China entire. 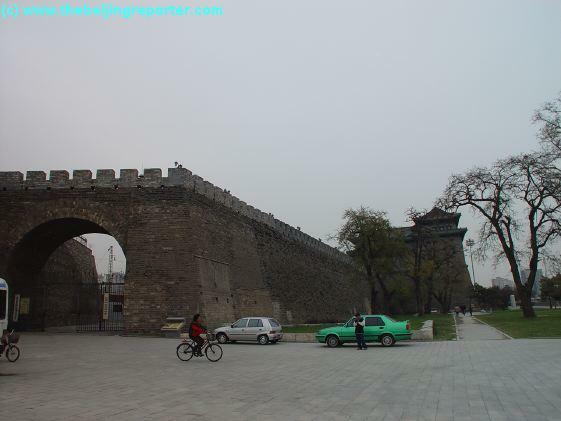 The tower was constructed in the year 1436 AD, and is built on a rectangular stone platform that protrudes from the extends of the 30 meter heigh City Wall proper. 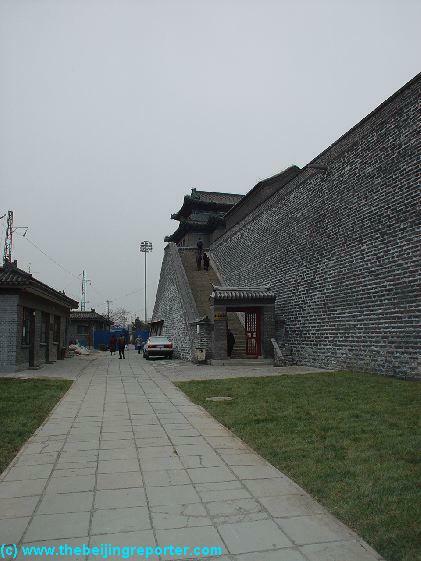 One of the Landmark buildings along the Route from the Ancient Observatory southward to the South-East Corner Watchtower (photo November 2003 AD). 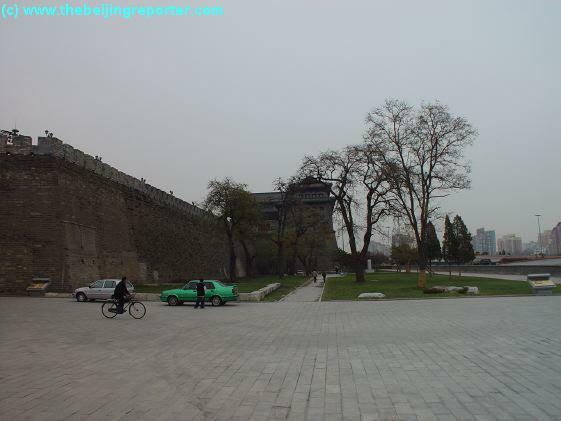 Still further South along the Route down from the Beijing Ancient Observatory one comes across some hidden and now preserved sections of the Ancient Ming Dynasty City Walls of the Old Imperial Capital (Photo November 2003 AD). 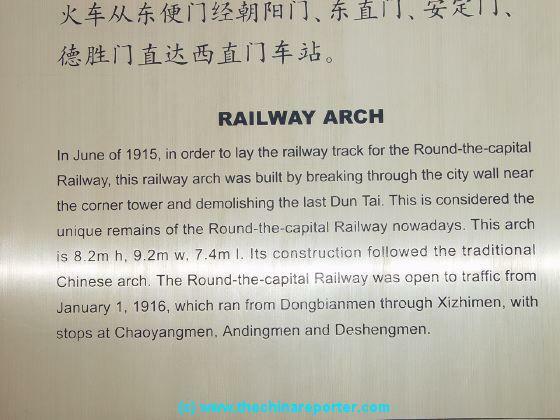 After having navigated along the 2nd Ring Road down from the Observatory one finally reaches the DongBianMen Park and the South-East Corner Watchtower and small Park. Across lie the railroad tracks that pass through Chongwen District. (Photo November 2003 AD). 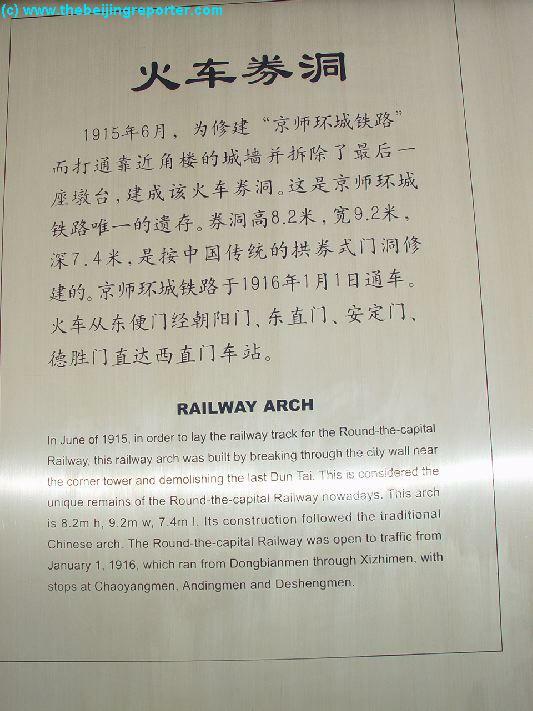 Located roughly some 500 meters due South of Beijing Ancient Observatory. 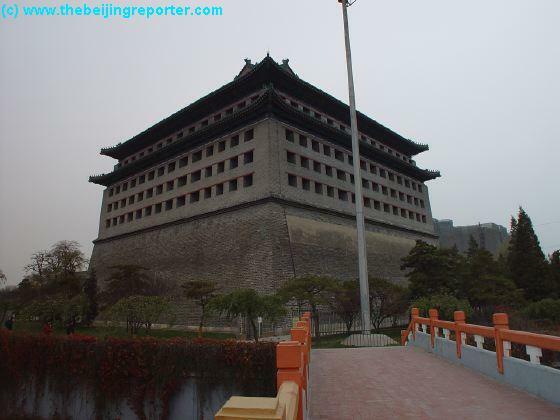 The South-East Corner Watchtower ( Dongnan Jiaolou') itself stands even taller. 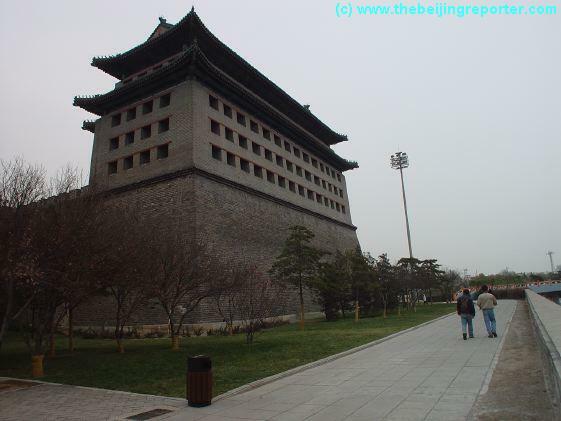 The Watchtower is constructed in an L-Shaped (or curved ruler) form and is protected by strong tiled brick walls on all 4 sides. The 4 re-enforced walls of the Tower have many windows, a 144 in total, which used to offer protected shooting positions for archers on guard duty inside the tower from which they could lay down a very accurate cloud of arrows at or on anyone down below. The roof of the south-east corner watch-tower lies on top of the 4 re-inforced walls and has a special shape. The two ridges of the Tower Roof intersect at each corner of the building making for a stronger, more impact resistant construction. The glazed roof tiles are in colors greay and green, with green glaze lining the ridges and providing the color for the mythical animals lining each corner. 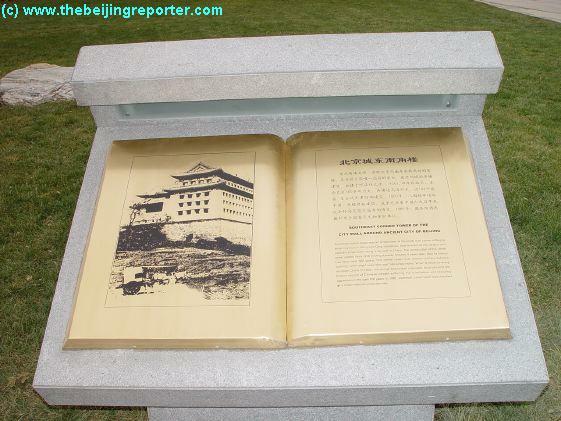 Inside the Corner Watchtower ( Dongnan Jiaolou') is a splendid exhibition on the historical relics of the Chongwen District giving an interesting perspective on the social, economic, political and military development of the Chongwen District as well as the Cities walled defenses. 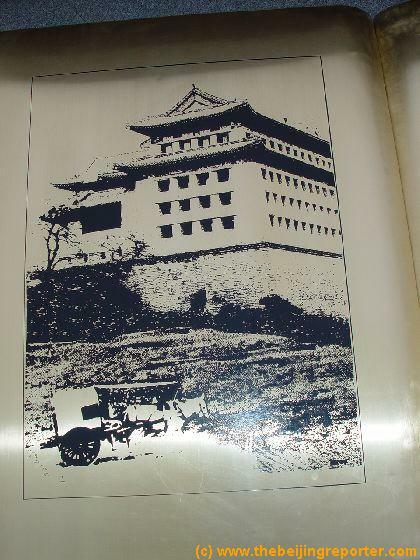 On the ground and second floor inside the tower one can find the continuously changing treasures of the "HongMen Art Gallery", better known as the Red Gate Gallery established by Australian China Buff and Art Lover Brian Wallace. 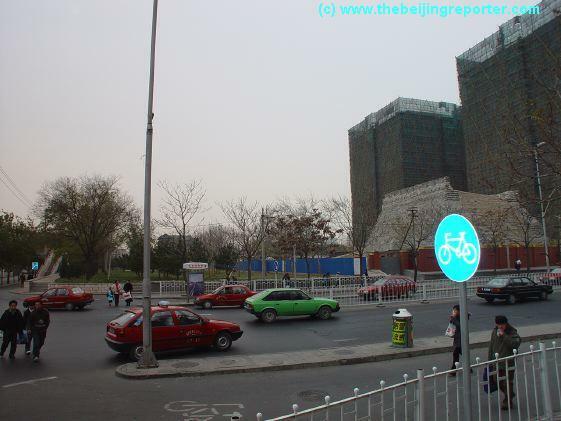 Today, the Red Gate Gallery is one of the leading modern and contemporary art galleries in the City of Beijing. A view of the official main gate and entry point of the South-East Corner Watchtower, located underneath the Eastern flank of the Tower. 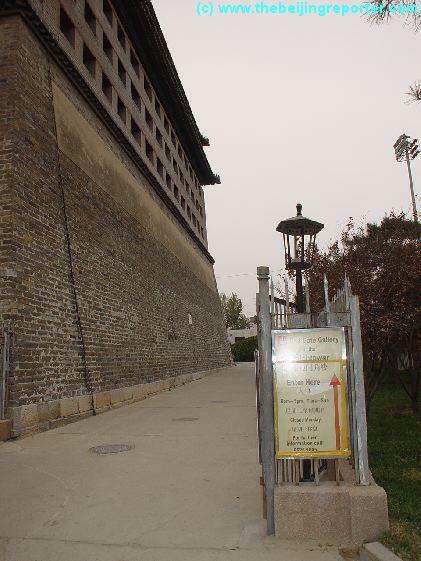 It is however possible to enter through the West, a slighty more interesting route (Photo November 2003 AD). 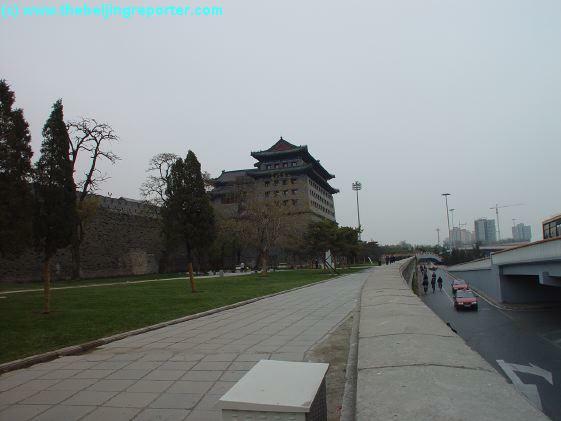 The small Park surrounding the South-East Corner Watchtower with in the left (S-West) corner the pedestrian walkway across the second ring road & overpass at this point (Photo November 2003 AD). 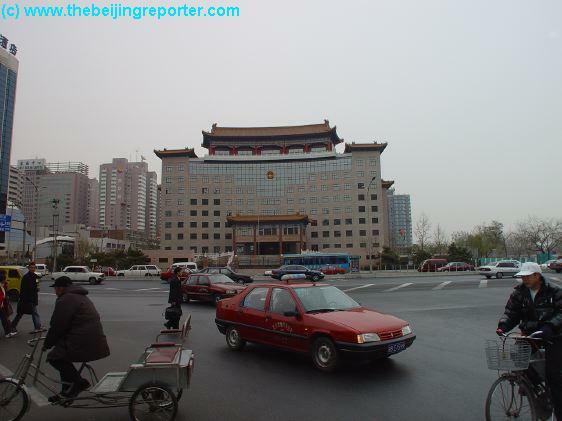 DongBianMen Park, South-East Corner Watchtower and second ring road traffic (Photo November 2003 AD). 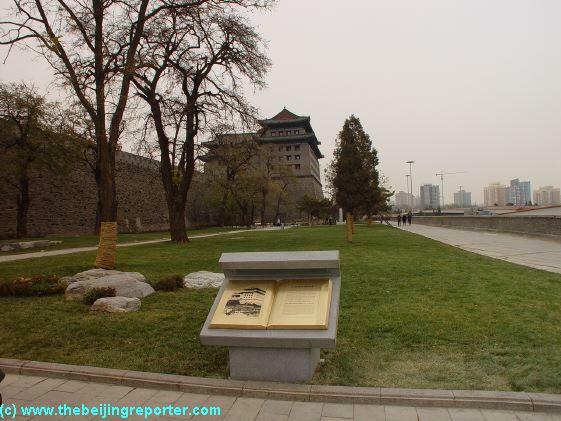 Take the Stairs up to 30 Mter High the City Wall Platform from which one can overlook parts of Beijing Main Train Station and ofcourse the Ming Dynasty Era City Wall Relics and Park (Photo November 2003 AD). View of the West Entrance to the Tower and City Walls, which was constructed as a Gate for the first steam-trains to reach into the City in the Late 19Th Century. A View along the North Flank of the Watch-Tower and City Walls. Visible on the Left is the Ticket & Service Office with behind it some of the electric wiring of the adjacent railway line visible.